My name is Dada Gunamuktananda. 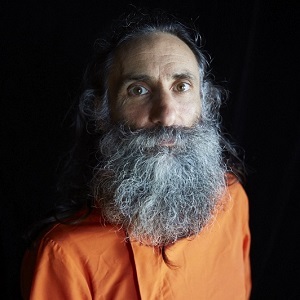 I have been a yogic monk and meditation teacher since 1995 and have taught meditation in Australasia, Europe, North Africa, the Middle East, the Far East and North America. I practice and teach the system of life known as yoga or tantra, the core practice of which is meditation. Meditation is about finding the essence of yourself within yourself and realising that essence as the inner self of all beings and the entire universe. This I believe will lead to the greatest happiness and fulfilment for everyone and the whole society, and that’s why my mission is to teach meditation to as many people as possible. Summary: Dada’s answer to the five questions! Listen to the full conversation on the player above; also available on iTunes, Stitcher and Soundcloud. I think hope is linked to faith. So my definition is hope is faith in a better future that what you’re going through at the moment is not in vain – that it’s a part of a process of being guided towards a better future or a greater destiny. It’s my guru, my spiritual teacher, Shrii Shrii Anandamurti. He was a great guru, a teacher of the highest order, a great person, a great being. We have a concept of self-realization in yoga and I believe that my guru was born self-realized. He didn’t actually have a teacher of his own and the teachings that he gave have been so comprehensive and so profound and practices are based on those teachings. Quite simply, what he has given has had a very profound influence in my life. Before I learned meditation, I was living a very materialist point of view and was questioning what the point of life was. I was heading towards a bit of a dead end. When I learned meditation, I learned the teachings, the philosophy and the practice from my guru. I was very inspired and it’s given me hope ever since. Meditation is a daily practice. By doing that and looking within yourself and really trying to feel the happiness within you, it’s going to give you hope, it’s going to give you inspiration. It’s going to give you the strength to get through the daily grind and all the stuff that happens in life that we can’t avoid. Meditation will give you the strength to take life on with the right spirit and get through the problems. It happened to me in a huge way when I first learned meditation because I was getting into a kind of an existential crisis and I had been searching for a couple of years before that for a deeper way of existence or being or a deeper meaning. When I came across Ananda Marga and my guru and his teachings, I believe it saved me because I think I would have deteriorated, I would have gotten into a big funk. It took me out of that and I haven’t looked back since. The kind of things that I’ve been talking about here, I taught to people almost on a daily basis. I try to give inspiration as well as practical advice. I do this regularly and I meet a lot of people. I think the universe arranges or the universal consciousness arranges for me to meet people when it’s appropriate. I believe that if you want to help people and you feel confident in doing so and you are able to do so in some way, if you’re available, I think you are automatically put in touch to people who need the help. (1) I would recommend people to learn meditation. That would be a way of experiencing hope in your own life as well as sharing it with others. (2) Service is also important.